So she resigned. What next? Imagine my disappointment this morning when, over breakfast, the man on the radio told me that the subject of today’s blog had already resigned. I had been gazumped, or, as my name is already Gaz, I had just been ‘umped’. 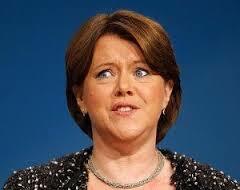 All I had wanted from this whole debacle was to see the back of Maria Miller after I had written this blog telling people why. But then, I thought, as the blood trickled from my knuckles onto a passing ant, maybe I can still do the blog, but about the reaction to her resignation? I turned up the radio, and lo and behold, an interview was already underway between John Humphries and some of those politician types: one from each of the main two colours – you know, the red and blue ones, the Smurfs and the Hellboy’s. “It should have happened last week! It has further damaged politics and the public perception of politicians” she declared, rather more vigorously than her actual party did, but still with all the sentiment of a walnut. The man Humphries jumped at his chance to ask if politicians should perhaps, you know, not ‘mark their own homework’. To which the red lady agreed in the strongest, vaguest terms possible. And then they ran out of time. Poor blue man felt very put out for only having such a short amount of time to reiterate that nothing needs to change and it was everybody else’s fault. He needn’t have worried, I think we got the picture (even though it was on the radio, which is really clever). So I switched off the voices, muttering some violent swearword in regards to the last speaker, and came to my computer to find out more. Luckily, it seems the rest of the country was also listening to the radio, because it’s all over the news. Why should MPs have the luxury of managing their own departures/resignations after committing fraud? What does it say about the world-view of the PRIME MINISTER of this country, when he so obviously favours self-protection of his inner circle over the people of this country and basic moral decency? Why weren’t Labour officially calling for her to resign? Apart from a few dissenting voices, the cross-party political class basically closed ranks on this, VS ‘the public’. (the obvious answer is again, self-protection, should they ever need to use this ‘get-out-of-jail-free’ system for their own ends). You are meant to be the cocking opposition! She still isn’t going to be paying any more money back or facing criminal charges from the look of it, so she’s done rather well for herself, and no longer even needs to worry about going to work! She can probably retire on the profits she’s extorted. On a positive note, in felt to me like the real proliferation of this story was taken up by ‘the public’, and only instigated by the media, who then recognised the anger it had caused and fed back into it. I don’t think we were led by them, I think this one was mutual. I’m guessing the 150,000+ signatures on the e-petition were a great help. The arrogance of the PM in offering unwavering (and ‘warm’) support for someone who had quite obviously fallen short of the standards that should be required. Learning of the way that the initial report and recommendations by an ‘independent’ committee was over-ruled by a separate MP led committee who exist, it appears, only for purposes such as this. Learning that the ‘independent’ committee has only two independent (none party affiliated) members anyway, both of which don’t have a vote. The whole obvious rigged game that is caused by points 2 & 3, and imagining the motivations of the kind of people who would come up with it. So actually, the precise details of Miller’s affair were not as important to me as the above, because the above is indicative of the attitudes and systems that cause this massive gulf between ‘us and them’, and is in my opinion, the biggest problem facing our country (and much of the wider world). I don’t mean just these things specifically, but the whole approach to accountability and such like. Was today a victory for people-power over politics? Not unless any of the above points are actually dealt with: not ‘tinkered’ with – dealt with. Why not, for example, replace these two committees with a new committee selected from the public in much the same way as jury service? And give us the right to recall MPs (as they promised they would)? Oh, yeah, and Cameron has to go, obviously. The question is, why don’t they ever actually introduce progressive legislation to enforce the accountability and transparency they so often tout in speeches and manifestos? Why don’t they hand the responsibility to the people? The simple answer, I guess, is because they know what would happen if they did. Which when you think about it, is a really bad state of affairs, and all the more reason we need it. So what happens now she’s gone? More of the same after a brief period of rhetoric about ‘change’ and ‘transparency’? Probably. But if we can act together like we did this week, with common purpose and outrage against the presiding political class, who now seem to be more distant from us than ever before: maybe we can see a few more heads roll? Maybe even change things for the better. That’s a nice thought. I feel a bit better now.